Live Special Effects Show Specialists. 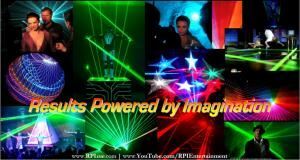 Laser Shows, Special Effect Spectaculars, Falling Snow Events, Snow Sledding Parks, Mobile Ice Skating Rinks, Holograms and Fully Immersive Entertainment Attractions. Our award-winning work has dazzled audiences worldwide since 1990! RPI [Results Powered by Imagination] offers a wide of array of creative services, all of which revolve around highly focused areas of expertise: Entertainment Technology and Live Shows. RPI has become a # 1 industry resource for that winning finish “Ultra-Creative, WOW! Factor” that our high-end 'partner-clients' build their reputations on--We proudly provide each one with their very own “Eureka!” moment.